involved in the binge drinking culture and how finding out she was pregnant she knew she had to stop drinking. now view the Advert on Youtube Janet wishes to remind viewers - No babies were harmed in the making of this ad!! Aug 2016: FASD Action Plan for NZ: On Tues 16 August the Associate Minister of Health Peter Dunne launched a 3 year whole of Government Plan to address FASD prevention and intervention and announced an initial investment of $12 million. FASD has been conservatively estimated to cost the country $800 million every year. The priority areas covered in the Plan are Prevention, Early identification, Support and Evidence. The Taking Action on FASD: An Action Plan 2013-2016 can be downloaded from the Ministry of Health website Click here to view the Plan. This new resource from the Health Promotion Agency encourages all health professionals to provide consistent messaging on alcohol and pregnancy. MiniDoc: Justice for FASD Being an adolescent male can be hard. But add to that an invisible disability affecting how you learn, how you think and how you behave…It can soon become a nightmare. Daniel and Jakob are two teenagers who have a surprisingly common and yet largely misunderstood disability - Fetal Alcohol Spectrum Disorder. Watch the full episode now! Auckland Law School lecture from Judge Catherine Crawford ‘How youth affected by FASD are treated in criminal jurisdictions’ and/or listen to the audio of her lecture. Two new papers contributing to our understanding of Fetal Alcohol Spectrum Disorder have been added to the FANNZ website. 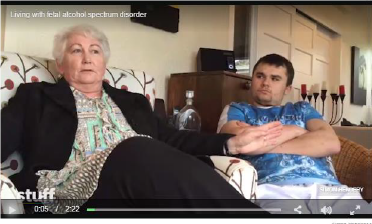 New Zealand FASD specialist psychologists, Valerie McGinn and Andi Crawford discuss different features of FASD behavior - the importance of understanding Adaptive Behaviour and Confabulation . The Fetal Alcohol Network provides information and opportunities for people affected by fetal alcohol spectrum disorder to connect, to learn, to advocate and respond more effectively to prevention and family support.